After the long and unusually harsh winter the cart drivers had the chance to experience the roads that are free of snow. Since the destruction of Uhm the trade routes of the Amia forest became the most used ones between Wharftown and the Northern cities and ports. Since the horde of One-Eyed and the attack on Wharftown, the mylock/myart problems, the cart service also found that the trade routes between Bendir Dale and Wharftown should also go through the Amia forest even if it is considered a slight detour. Trade indeed went on flawlessly and the Amia Cart Service and the Roadwarden Society made significant efforts to maintain the trade routes, without angering the local Druid Grove and harming the balance. However, in the past few days the Amia Cart Service and the Roadwarden Society started reporting feral beasts attacking them. Although reports indicated that the initial attacks were fended off by the caravan guards, one famously drunkard cart driver by the name of Harold was reported having been delayed more than usually. Due to the delay and the previous attacks the main company, the Amian Crafter's & Trader's Federation has decided to employ the Wave and Serpent Adventurer's guild to investigate the matter. With the arrangements being made by charming Theresa Mason and with the leadership of the giant-kin Artemas a trade caravan, guarded by temporarily employed adventurers, indeed departed from Cordor destined towards Bendir Dale and from there to Wharftown. Rumors are indicated that they found Harold, the drunk cart driver along with his caravan guard. They are both suffered a painful death it seems, while the caravan itself was also attacked by savage-looking individuals and beasts. Some say that the attackers were lycans! The rumors have seemingly triggered some panic among the cart drivers who are flooding Cordor office of the ACTF and demanding the leadership to abolish the hiring freeze on the Roadwardens. While the already employed Roadwardens are demanding a raise and additional benefits. Although the confusion is usually bad for a merchant organization the ACTF is no typical one. Some of the ACTF partners, like the insurance salesman Sellit Nibbler is taking advantage of the situation and starts selling insurance, producing additional revenue. In the meantime, the ACTF's rival, the Cordorian Merchant Guild, which has a bad reputation due it's questionable ties during the Arcanum war is now trying to take advantage of the situation to regain their lost revenue. Having been specialized in long distance shipping they are trying to use the now one-year-old trade treaty between Cordor and Kohlingen and trying to use the reduced tolls to reach the market of the Sword Coast again. But when it comes to sea trade, a foreign merchant company is also knocking on the doors of Amia with GOLDEN OPPORTUNITIES. After the initial Road Rumors more of the ACS carts suffered delays which triggered from attention from the center of the ACTF in Forrstakkr, indicating the greater need to hire adventurers as Caravan Guards as the problem reached to a certain point what the Roadwarden society can no longer handle. Now even the adventuring population suffers heavily from these mysterious activities and humanoid bones can bee seen all over the forest, with claw shaped carved into the skulls. Meanwhile the sounds of a smaller battle shook the lands of the Amia Forest near the elven enclave of Winya Ravana. Later a contingent of guards lead by Lieutant Quivalor, the former knight of the sun from Evermeet, takes a closer look on the situation. They soon returned with some grave news to the residents of the elven enclave. "I heard you're looking for help guarding some caravans... "
Since the battle in the Amian Forest, the Grove Ranger, Elrith, keeps a much more sharper eye out around the Western side of the forest, patrolling it frequently, if not every day. But never by herself, if she isn't with her husband, Crow, she is with her several dire wolves, following along. Keeping her silver arrows stocked and a hand on the hilt of her blade just in case, she continues to patrol the forest cautiously, and quietly, as well as checking the road through the Nexus Falls, when coming out of the forest. The struggle in the forest continues. The beasts, now clearly identified lycans are trying to dominate the western part of the forest where frequent crashes occur with the members of the Grove or the now more competently guarded trade caravans. Captain Vichard of the Oakmist Vale begins to strengthen the fortifications around the druid Grove and rangers increasing the numbers of patrol. Meanwhile the Elven Enclave of Winya also begins to form fortified stances in the Nexus Falls while elite guards, lead by Lieutenant Quivalor of the Golden Star are also making skirmishes to keep the beasts away from the preparations. Some sighting occurred near Bendir Dale too but for now, no clashes occurred. Regardless of that, the militia is now starting to come up with a new alarm sign for lycans. The trade struggle continues! Rumor has it that the ACTF has some rejuvenation by renewing the Aquisition and Security branch of the organization, and that increases the confidence of the market. Meanwhile the competing Cordorian Merchant Guild took wing as it was able to book many of the ship routes while the ACTF was distracted. While the two are competing, a third party takes advantages on the market with unmatched competence and thus they present GOLDEN OPPORTUNITIES. Adair would linger by the western forest from time to time "incognito" to keep watch over the trees and shrubbery in an attempt to keep grubby werepaws off the bark. If by chance Crow is actually seen on his patrols of the western forest, a gleaming silver longsword, of more than exceptional quality, might also be seen wielded in his hand, as he makes his way silently through the untamed lands. The ranger is generally trailed by large dire wolves, or he is accompanied by his wife Elrith, and even more dire wolves, while they keep a sharp watch around the area. After hearing from some of his elven kin regarding the problems and fights going on. A lone elven man makes his way to the woods. This Or-Tel-Quessir may be recognized by some if seen, but others he would just look perhaps like a rather dirty and commonly dressed elf. After a time it would seem he would slip from sight with a very rough and mangy looking wolf companion. This wolf would have many scars on it, a missing eye and tuffs of fur missing off her. Despite that she would give off a very intimidating pressence, one that would likely give a bit of fear in a person. As they vanish, it would later be seen as quite a few Malarite bodies would be found in burning piles. Elven arrows and slash marks would be on those still fresh. There would also be signs of traps laid around the local woods. These traps would be very skillfully placed, if anything like that of a master and often there would be a rather large casualty count among the prey of the hunter. Small marks would be placed near these places in elven to help booster some moral among the elven hunters around who are also fighting. As the patrols occur from both the north and the east more frequently, the lycans are seemingly become less visible and the attacks come more out of surprise unfortunately for the poor travellers. The forest on the west and the east appears to be more silent than usually. Clearly, even the local wild life is afraid of the outcome. Seeing how well did the incognito work for a certain individual a lycan even uses the undercover tree to mark his territory. Apparently it is an issue lately between the local wildlife and the invader lycans. The tree apparently objected to the marking, and a branch came crashing down on the poor lycan as he heeded nature's call. From time to time Jason could be see patroling the trade routes, doing his part to keep the roads a little safer. The forest of despair would be littered with the remains from many skirmishes, as the ongoing battle takes another front, with a pair of rangers going on the offensive. A Well armed man in Kholingen colors has been seen walking from cordor all the way to Kholingen and back quite often. His sheer size would likely be a deterant for most opposition. Some would say this isn't the first outfit they have seen him do this in. One even referenced an old trading company known as the Sembian trade Corp. With their gold and purple coloring, and vast amounts of wares. Perhaps trade route control comes second nature to him. The knight captain can be seen walking the roads but not in his uniform. He wears his old settersborg furs with some new silver aditions. A large silver axe in one hand, and a silver lined net in the other. Perhaps he isn't hunting to kill, but perhaps capture. *A someone would take interest in the scents and markers placed here and there in the forest. Sticking to the edges of the at first she would soon begins to crisscross it, seemingly at random and avoiding the roads. At times perhaps an elf, sometimes a wolf or a seeming mix of the two, the tracks it leaves moving on four or two legs as they wander the forest with no clear direction, exploring and investigating scents left on trees. The big battle in the forest would bring a temporary peace to the land which lasted for one or two tendays. However, in the past tenday caravans starting to get harassed again. Reports from the rangers and the Roadwardens indicate that the situation is getting worse each day. In the meantime Winya got attacked by the creatures but with the valiant defenses issued by the locals and the Seekers they were broke back. Regardless, the elven enclave is on a heightened alert. Wharftown is getting harassed despite the precautions that the Selunite clergy made. In the meantime Kampo managed to recover the loss of trust capital somehow. Rumors are indicating that an unknown party negotiated with him or something. Regardless, merchants are flowing there again and business is good. Meanwhile the trade parties in Cordor are continuing their contest for dominance. The CMG begins gain visible advantage over the ACTF and rumors are indicating that they show interest in the now developing West Cordor. The events around the road begin to escalate. Despite the Selunite wards, Wharftown begins to have more and more hostile lycan sightings from the nearby forest of despair. Considering the amount of clashes that people learned about between the hostile lycans and various state and non-state actors the local folks begin to wonder where do they come from? Is this a curse? Recently a smaller warband of elves were seen entering the forest from the direction of the Nexus Hills. Meeting up with some members of the local Grove they ventured deeper into the forest. Rumors in Bendir Dale and some of the traveling merchants indicate a larger clash between the lycans accompanied with some minor ground shake. But nobody knows for sure what happened there. Rumors are spreading around about renewed attacks on the roads in the Forest. Something may have angered or intensified the ravaging style of the lycan armies that entered the land. Both the forest and the outskirts of the Nexus Hills can be seen suffering from them. So does Wharftown where prices (other than fish and seafood products) begin to increase due to the isolation. Troubling news can be heard from the mainland though that the merchants and adventurers bring from distant lands. Aglarond, the beginning of the unapproachable east has experienced aggressive activities in the Yuirwood by lycans who were not known by them. While initially blamed the situation on Thay, other events seeming confirm that it is not the magiocracy of the Red Wizards. The Western Heartlands show much disturbing news as well. Lycans can be seen outside Baldur's Gate, Gullykin and all around the Wood of Sharp Teeth. 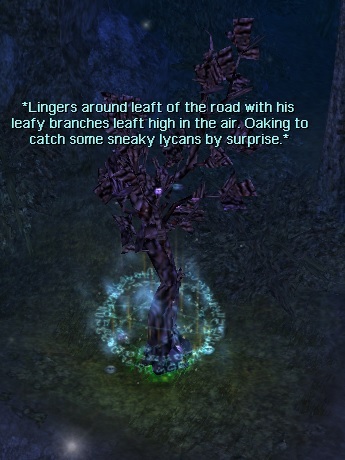 Much the same applies to the High Forest where local wood elves are being disturbed by odd lycan activities. The forest of Cormanthor and the Daleands in the inner part of Faerun begin to issue reports. While the elves began to dissolve the Retreat and started to take back their abandoned estates and enclaves in the region, the lycans seemingly didn't spare them either and attacked them. The otherwise reclusive but known Druid Circles such as the Emerald Society and the Druids of the Tall Tree begin to talk about dangerous events and their agents can be seen appearing more and more along the company of the representatives of their allied organizations. Rumors are spreading around that after a few days, the lycan attacks began to become more violent but there is a changing pattern. The enraged lycan population was seen breaking into various settlements, clearly looking for something. While a larger pack seems to have reached the outskirts of Evereska and smaller elven enclaves on the mainland until they got defeated by the defenders. Regardless, they seemingly have become desperate more than ever before and people begin to assume that they might be searching for someone. The hidden druidic enclaves all over Faerun begin to suffer such fate as well. However, rumors also speak about a battle and a growth of resistance in the Wood of Sharp Teeth. Following the events of the mainland, the forests of Amia are becoming extremely unsafe again even considering the recent excursions. But how did they get here?